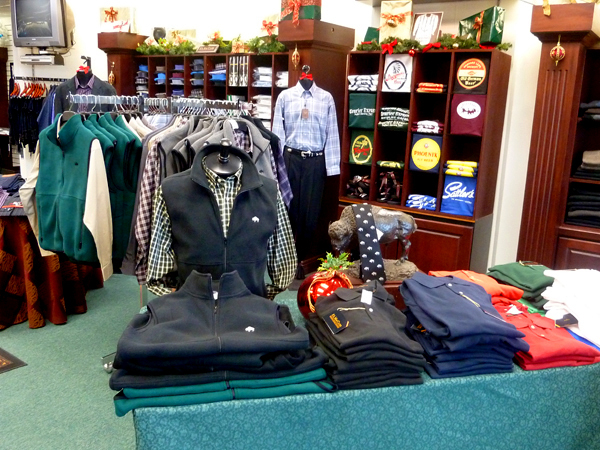 I stopped into Riverside Men’s Shop during lunch today to do a little holiday shopping for my dad. I’ve never been able to make it out there because it’s kind of difficult to get to, but after hearing that it was voted Best Men’s Clothing Shop in Buffalo, I had to go take a look. The shop was nice. I don’t want to say I was underwhelmed… they do have a lot of nice stuff there, their Buffalo’s Own Collection for example is great and very well priced, and I loved their collection of Vintage Buffalo Beer Tees, I guess the decor just left me wanting more. After seeing O’Connell’s which has this great old world feel to it, Riverside just looks like just another store in a strip mall. What I can appreciate is how everything is much more organized than O’Connell’s, but they don’t have nearly the selection (or maybe they do, it’s just not stacked in piles for all to see). The shop also has a pretty impressive history. Opened in 1918 by Samuel Ehrenreich it was a simple work clothes and haberdashery store. In 1935, the store was incorporated and named Riverside Men’s Quality Shop, Inc. After a fire destroyed the original building in 1940, a new one was erected a few years later using the most modern features of the day. The all-new shop boasted Buffalo’s first air-conditioning, first plate-glass doors, and first fluorescent lighting. For almost 90 years the Ehrenreich family owned and operated the store until 2007 when it was purchased by the current owners, Natalie and James Neumann. I would like to also point out that the staff was extremely friendly and helpful, and while some of their stuff does tend to run pretty large (damn you Buffalo) the store is definitely worth a visit. Other highlights were a strong collection of bow ties (again, I think quality over quantity is their thing) and their Buffalo Nickle Cufflinks which are officially next on my list of purchases.